Essential Records band Red received a RIAA Gold certification for its single “Breathe Into Me” from the End of Silence album. The honor follows their sixth GMA Dove Award win for Rock Album of the Year for the 2015 release, Of Beauty and Rage. 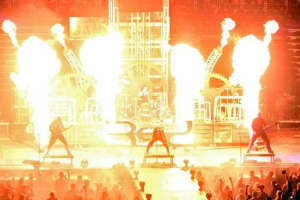 In the past decade, Red has received two GRAMMY nominations, six Dove Awards, two Top 10 Active Rock singles, three Top 10 Mainstream Rock singles and 19 consecutive No. 1 hits at Christian radio, according to Merge PR. The band has sold more than 1 million albums collectively. Red will be on the spring 2016 Winter Jam tour, hitting more than 45 arenas and stadiums across the country.